Each year, roughly 15 percent of Federal-Aid Highway Program funds go to local public agencies. As part of the Every Day Counts initiative, the Federal Highway Administration is encouraging states to adopt three strategies to help cities and counties administer those projects successfully. Using the strategies—stakeholder partnering, certification programs and consultant services flexibilities—can assure that local agencies follow federal regulations and guidelines and reduce the amount of oversight states need to provide. It can shorten project delivery time and lower project costs. And it can enable qualified local agencies to manage and own their projects. Communication, coordination and cooperation are vital to implementing locally administered Federal-Aid projects successfully, as is clarity on federal requirements. Establishing stakeholder committees with federal, state and local representatives can aid the partnering effort among agencies and make it easier to get buy-in on projects. The committees encourage communication, review and refine project development policies and processes, and ensure appropriate training is provided. One state using the stakeholder approach is Florida, which has a Local Agency Program Community of Practice with representatives from the Florida Department of Transportation, the Local Technical Assistance Program, local agencies and FHWA. Among the group's tasks are identifying and evaluating highway project development and implementation processes for which streamlining is needed to ensure consistency across the state. Through certification programs, state agencies confirm that local agencies have the ability to manage all or part of the project development and implementation process. Benefits of certification programs include fostering interagency partnerships, creating evaluation and streamlining processes, and providing outreach and education. The programs enable states to delegate responsibilities under the Federal-Aid program and allow certified local agencies to manage their own projects. The Oregon Department of Transportation, for example, offers a tiered program through which local agencies can become certified in certain areas of Federal-Aid project delivery, allowing the agencies to retain more local control when developing projects. Areas in which local agencies can become certified include design, consultant selection and construction contract administration. The Federal Highway Administration now offers incentives for State Transportation Innovation Councils. FHWA Administrator Victor Mendez announced the program at a national meeting of STICS in September. Under the program, each STIC can obtain up to $100,000 per year to support its innovation efforts under the Every Day Counts initiative. For details, contact the state FHWA Division at https://fhwaapps.fhwa.dot.gov/foisp/keyFieldFederalAidDivisions.do. Using consultant services helps agencies with limited staff and resources manage locally administered Federal-Aid programs and projects. Among the practices state agencies can adopt are establishing policies and procedures to help local counterparts procure and manage consultant services effectively, developing contracting options for local agencies and using consultants to manage local agency programs. Several states already use one or more consultant services practices. The Kentucky Transportation Cabinet, for instance, has a statewide on-call contract for consultant services that local agencies can use on projects. The Wisconsin Department of Transportation uses consultants for local program management, as well as maintains a roster of prequalified firms. When a local agency chooses one of those firms, the local and state agencies and the firm all sign a three-party contract. To assist state and local agencies, the Every Day Counts team on locally administered Federal-Aid projects is providing Webinars, conference participation, peer exchanges, technical assistance and tools such as fact sheets and case studies. Recent examples include a peer exchange on certification programs for the California Department of Transportation and participation in the Maryland Association of Counties Summer Conference. 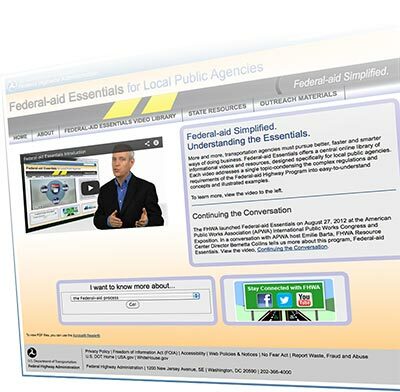 The “Federal-Aid Essentials for Local Public Agencies” website at www.fhwa.dot.gov/federal-aidessentials features a resource library of about 80 short videos. It also lists state resources for local agencies. “Local Public Agency” at www.fhwa.dot.gov/federalaid/lpa provides Federal-Aid background for local agencies, as well as reference guides and training resources. “Consultant Services” at www.fhwa.dot.gov/programadmin/consultant.cfm covers regulations, policies and guidance on using consultant services. Practices and Performance Measures for Local Public Agency Federally Funded Highway Projects, a National Cooperative Highway Research Program publication at http://onlinepubs.trb.org/onlinepubs/nchrp/nchrp_syn_442.pdf, provides an overview of practices used in Federal-Aid project development and management. Time is money, as the saying goes, and geospatial data collaboration is helping highway agencies save time. Geographic information system tools at many federal, state and local agencies are housed separately, which can make partnering on projects challenging. Through the Every Day Counts initiative, the Federal Highway Administration is promoting geospatial data collaboration—which makes tools, data and maps available on the Web—to facilitate information sharing among project delivery stakeholders and improve the quality and speed of project decisions. Geospatial data collaboration can improve working relationships among organizations, simplify data sharing among project participants and enhance information flow in the environmental process. It can also reduce the time required to assemble and manage data, automate repetitive analyses, and improve the quality and timeliness of decision-support documents. Web-based technology offers project participants the flexibility to access data and tools anytime and anywhere, while enabling organizations to control access to data and share only the information they wish to provide to partners. “What we are trying to do with geospatial data collaboration is emphasize the 'how' part,” said Mark Sarmiento of FHWA's Office of Planning. “How are states delivering highway projects faster or more efficiently? How are they streamlining the environmental review process? How are they linking the planning and environmental review processes? Several states have developed GIS-based tools and are using geospatial data to support project development and environmental streamlining efforts. The South Carolina Department of Transportation, for example, created a web-based Project Screening Tool that incorporates GIS data to help users identify impacts from potential projects. The Florida Department of Transportation has an Efficient Transportation Decision-Making Process that uses a web-based screening tool for making project decisions. 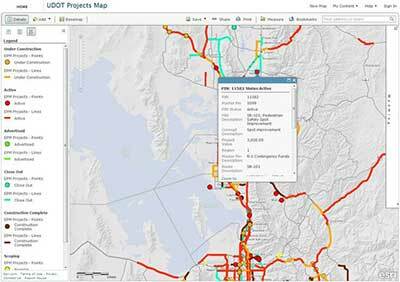 The Utah Department of Transportation developed a system for geospatial data collaboration called uPlan. It uses cloud-based technology that makes all tools and data accessible over the Web, allowing internal and external partners to create maps and share the latest data. Access to the data can be controlled to allow sharing of only the data that partners want to provide. In some cases, the Utah DOT's preparation time for environmental assessments and “finding of no significant impact,” or FONSI, documentation has dropped from four to eight weeks to less than a day. FHWA offers several ways to learn more about geospatial data collaboration. A webinar on the Utah DOT's uPlan tool is at www.gis.fhwa.dot.gov/webcast13_uplan.asp. Another webinar, “Integrated Environmental Planning: Tools for Enhancing Environmental, Transportation and Tribal Capacity,” is at www.gis.fhwa.dot.gov/webcast11_iep.asp. A new Technology Partnerships study will evaluate a mobile measurement system used to assess the safety of pavement markings. 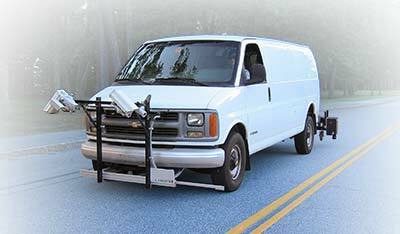 The Leetron Mobile Retroreflectometer Unit, developed by Leetron Vision LLC of Concord, N.H., works in real time at highway speeds to measure pavement marking retroreflectivity, which is important for nighttime driving safety. The Technology Partnerships program provides grants to private industry to fund proven, late-stage prototypes that require further development and evaluation in a real-world setting before they're ready for the commercial market. It's part of the Federal Highway Administration's Highways for LIFE initiative to accelerate innovation use on the nation's highway infrastructure. Nighttime driving is hazardous because drivers can't see road markings as well as during the day. Although only a quarter of travel in the United States occurs after dark, according to FHWA statistics, about half of all traffic fatalities happen then. Retroreflective pavement markings improve safety and prevent roadway departure crashes by bouncing light from vehicle headlights back to the driver's eyes, making the markings easier to see in the dark. A screenshot from the Utah DOT's uPlan shows a map of transportation projects at various stages of activity. 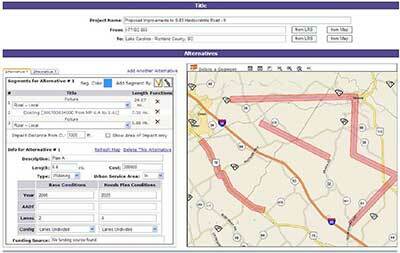 A screenshot from the South Carolina DOT's Project Screening Tool shows the tool's ability to provide information on project alternatives. Because the retroreflective properties of pavement markings deteriorate over time, highway agencies need to maintain them to ensure they remain clearly visible at night and meet federal requirements. While some agencies use fixed repainting schedules, measuring retroreflectivity, now done with both handheld and mobile measurement systems, can help highway agencies determine when pavement markings need to be repainted. The Leetron imaging system is designed to improve on current technologies and provide a safe, efficient, accurate and repeatable method to measure pavement marking retroreflectivity, according to developer Terry Lee. It uses a method of tracking measurements in real time that mitigates the effects of road vibration and surface roughness, the most challenging aspect of mobile retroreflectivity measurement. It aims a laser at the center of the pavement marking and uses a feedback loop to readjust the aim point as the vehicle equipped with the unit travels at highway speeds. “Leetron's sensor-aiming system is particularly effective at measuring the retroreflectivity of pavement markings on curves,” said Lee. The system offers a faster measurement method by allowing simultaneous measurement of markings in two lanes. It also has an auto-calibration capability, which no other system has, said Lee. With the availability of real-time retroreflectivity data, pavement markings can be scheduled for repainting based on priorities, enhancing road safety and allowing agencies to use their maintenance budgets more efficiently. The company plans to use the Technology Partnerships grant to refine its prototype system and work with the Connecticut Department of Transportation to conduct field tests comparing the accuracy of the mobile unit's data with that of a handheld unit. After evaluation by an independent organization, Leetron units will be used on demonstration projects to get feedback from potential customers on whether the measurement results meet their expectations. After that, the company will collaborate with highway agencies to use the units on full-scale data collection pilot projects on thousands of miles of state roads and develop a report on savings from optimizing pavement marking repainting schedules. Thirteen states and the District of Columbia will use $16 million in Federal Highway Administration grants to build highway and bridge projects that will improve safety, create jobs and enhance the quality of the nation's transportation infrastructure. Awarded by FHWA's Highways for LIFE program, the grants encourage states to try innovative technologies and practices that are proven but underused. Many of the projects will use innovations FHWA is targeting through its Every Day Counts initiative to expedite project delivery, enhance safety and protect the environment. The Colorado Department of Transportation plans to use its grant for a bridge replacement project in Aurora on I-70 over Smith Road and the Union Pacific Railroad. The project, the nation's first to use a geosynthetic reinforced soil system for a multispan bridge on an interstate, will reduce construction-related congestion with accelerated bridge construction. In Washington, D.C., the District Department of Transportation will use accelerated bridge construction techniques on its project to replace the 27th Street N.W. Bridge over Broad Branch Stream. That will simplify construction and reduce future maintenance costs. The Hawaii Department of Transportation will resurface Middle Street in Honolulu with portland concrete cement pavement, both post-tensioned, precast concrete and cast-in-place pavements. Using innovation will minimize inconvenience to road users during construction and provide a long-lasting road surface. In Illinois, the Knox County Highway Department will try three-dimensional modeling technology to finish construction faster on a Highway 4 alignment project near Galesburg. The 3D technology is also expected to save money, reduce lane closures and increase safety for construction workers. The grant awarded to the Indiana Department of Transportation will help the agency use innovation on a paving project on the I-465/I-65 south interchange in Indianapolis. The agency will apply a cutting-edge concrete surface technology to create a quieter and more skid-resistant highway surface. The Iowa Department of Transportation will try its first lateral bridge slide when it replaces the I-92 Cass County Bridge. The project will use prefabricated bridge elements, which will allow the new bridge to be built near the existing structure and slid into place. These innovations are expected to significantly reduce the amount of time the highway is closed to traffic. Hybrid composite beams will be used on a project to replace the Kentucky Route 70 Bridge over Stoner Creek in Taylor County. That will enable the Kentucky Transportation Cabinet to accelerate construction, decrease the impact on travelers and improve safety for workers and road users. The grant to the Louisiana Department of Transportation and Development will go toward innovation use on a project to reconstruct the Maree Michael and Creek Bridges in Vermilion Parish. The agency plans to use a number of accelerated bridge construction techniques to reduce construction time and project and maintenance costs. The Missouri Department of Transportation will apply high-friction surface treatments on Highways 54 and 179 in Jefferson City and two sites on I-44 near Rolla. Use of these skid-resistant pavement overlay systems will enhance safety while minimizing work zone delays and alleviating congestion. The Nevada Department of Transportation was awarded a grant for its I-80 Carlin Tunnels project east of Carlin. The project will use an innovative construction management program to install a new lighting system for the tunnels. The Oklahoma Department of Transportation will use bridge-moving technology and other accelerated bridge construction techniques when it replaces State Highway 51 over Cottonwood Creek Bridge near Mannford. Using innovation on the project will enable the agency to replace the structurally deficient bridge sooner and with less impact on road users. Intelligent compaction will improve overall pavement density and reduce costs on an asphalt pavement resurfacing project in Tennessee. The Tennessee Department of Transportation will use the technology at four geographically diverse locations: State Route 331 in Knox County, State Route 58 in Hamilton County, U.S. 64 in Lincoln County and U.S. 412 in Crockett County. The Vermont Agency of Transportation will use 3D modeling and intelligent compaction technology on a project on Vermont Route 107 in Stockbridge and Bethel. The agency chose the innovations to reduce congestion and enhance safety, quality and road user satisfaction. For more information on Highways for LIFE demonstration projects, go to www.fhwa.dot.gov/hfl/projects. For details on Every Day Counts innovations, see www.fhwa.dot.gov/innovation/everydaycounts. Accelerated bridge construction techniques and innovative project delivery methods are helping states build highway infrastructure faster and better. The Colorado Department of Transportation used self-propelled modular transporters to move a new bridge into place overnight on I-70 at Pecos Street in Denver. In addition to accelerated bridge construction techniques, the agency used the construction manager/general contractor delivery method on the Highways for LIFE-funded bridge replacement project. The new bridge, built directly on the ground, was jacked up, moved by SPMTs and slid into place on new abutments built below the existing bridge. The $18.9 million project will improve connectivity in surrounding neighborhoods for pedestrians, motorists and freight carriers. The Oregon Department of Transportation marked the opening of the new northbound I-5 bridge over the Willamette River in Eugene with a ribbon-cutting ceremony. The agency used the construction manager/general contractor delivery method to complete the $180 million project. The bridge aesthetics used on the project ensure that this signature bridge is not only functional, but also fits its environment. It includes design enhancements to honor the history and heritage of the Kalapuya Tribe in the area. The Florida Department of Transportation built the state's first two geosynthetic reinforced soil integrated bridge systems in northeast Florida. The agency worked with a contractor to build the bridges north of Jacksonville in Nassau County. A demonstration showcase held in conjunction with the project enabled transportation professionals to learn how to use GRS-IBS technology to accelerate bridge construction and observe its use firsthand on a job. The Washington State Department of Transportation used prefabricated structural steel elements to quickly construct temporary north- and southbound bridges following the collapse of the Skagit River Bridge on I-5. The bridge collapsed in May 2013 after an oversized load struck the trusses that support the bridge. The agency had the temporary bridges reconnecting I-5 completed in June and planned to have a permanent fix in place by October. The Pennsylvania Department of Transportation is progressing on its data collection and collaboration efforts. The agency won the Special Achievement in GIS Award at the Esri International User Conference for its innovative use of geographic information system technology to collect data on local roads and bridges. The new mobile collection method, part of an effort to modernize the road and bridge asset inventory, allows better, faster documentation. Also, Pennsylvania's State Transportation Innovation Council has accepted two ideas to optimize data use. One is the Data-Driven Approaches to Crime and Traffic Safety program, which is designed to help local police departments reduce crime, crashes and traffic violations. The other is the Transportation Operations Data Warehousing and Management project, which will bring various types of data into a common framework for archiving, planning, prioritizing and monitoring the performance of the transportation system. The Federal Highway Administration's Center for Accelerating Innovation publishes a weekly electronic news bulletin called EDC News that features items about what people in the highway community are doing with the Every Day Counts initiative. To receive it, sign up at www.fhwa.dot.gov/innovation/everydaycounts/edcnews. Construction is under way on a $15.6-million demonstration project to improve traffic operations and reduce congestion at intersections on U.S. 280 in Alabama. The project, which received a Highways for LIFE grant from the Federal Highway Administration, follows through on two Every Day Counts innovations: adaptive signal control technology and intersection and interchange geometrics. The scope of the project is to modify 26 signalized and nonsignalized intersections along 8.2 miles of the highway in Jefferson and Shelby Counties. Intersections will be modified by removing or changing traffic signals, eliminating access points, eliminating or changing turning movements and median crossings, reconfiguring side streets and widening intersections to accommodate additional turning lanes. The Alabama Department of Transportation chose the U.S. 280 corridor as one of three adaptive signal control projects it's pursuing under Every Day Counts. “The project has four goals: to reduce intersection crashes, improve travel times in the corridor, reduce congestion and improve air quality,” Ronald Baldwin, Alabama DOT chief engineer, said in the project's proposal for Highways for LIFE funds for innovation use. The project is innovative for a couple of reasons, said Rick Joki, transportation engineer with FHWA's Alabama Division. First, it uses U-turns similar to the “Michigan Left” at two intersections for a mainline left-to-right turn to eliminate the through movement from side roads. Second, it uses free-flow right turns to and from side roads, eliminating the side road through-traffic or left-turn movements at numerous intersections along with U-turns downstream of the traffic flow. The adaptive signal control system, already in place, is being modified to coordinate with the new intersection configurations. The number of signal phases will be reduced so that traffic can move faster through the corridor. 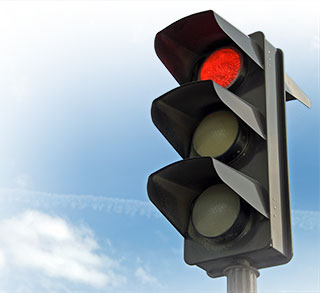 Adaptive signal control technology uses real-time traffic information to determine when lights should be red or green. Over the past 20 years, the U.S. 280 corridor has been studied extensively to determine ways to reduce congestion, such as by adding new capacity, constructing frontage roads and even building an elevated structure. Many factors have kept the state from advancing any of the options, notably the expense of acquiring right-of-way for widening U.S. 280 or adding frontage roads. The elevated double-deck roadway system is also cost-prohibitive. An Alabama demonstration project is combining innovative intersection modifications with adaptive signal control technology to reduce congestion and enhance safety on U.S. 280. Many traffic signals on the corridor have cycle lengths that provide 40 percent or less of the green time to the main arterial. To increase that percentage, many are being modified by removing signal phases. The turning movements at each intersection were evaluated to identify left or through movements that were underused compared to the other movements at the intersection. Most of the movements identified were either left turns from side streets or through movements from side streets across the U.S. 280 corridor. The most common alternate movement for both the left turns and through movements entails turning right and making a U-turn on the arterial where adjacent median openings and lane storage are available. The intersections were also evaluated to determine where heavy-volume movements could be aided with the addition of through or turn lanes. Many side streets along the corridor have a one- or two-lane approach. The project is adding lanes as appropriate for dual-turn or through movements. The additional pavement width needed for these new lanes was often offset by the removal of a signal phase. To reduce the impact of the 15-month project on the traveling public, lane closures will not be allowed during daytime hours. Also, the contract is a calendar-day project with incentives for speedy completion. Modifying the intersections to reduce conflict points is expected to reduce future crash rates by at least 20 percent, according to the Alabama DOT.